When I was 22 and graduating from college, there were a couple paths to take. The first path was to follow my dreams, a dangerous idea because the dreams of a 22-year-old are pretty underdeveloped. Yet, this is what our baby boomer parents often tell us to do. David Brooks does the subject a great deal of justice in an op ed in which he explains, "Most successful young people don't look inside and then plan a life. They look outside and find a problem, which summons their life." Young people are often guilty of deciding on our passions in a vacuum and it's no wonder with the cacophony of "follow your dreams" reinforcement we receive. To me, it's sort of how great novelists aren't very often great until their midlife, when they've seen enough of the world and its inhabitants to write about them with art and perspective. The dreams of my collegiate career and that of many others are only slightly more substantial than being a football player or an astronaut. The novel I would write at 22 would have protagonists with the depth of the Hardy Boys; in a couple decades I could produce something more nuanced (hopefully). Many promising young people I interact with tell me they're hell-bent on doing something that's good for the environment, or that they want to revolutionize education, or work in health and wellness. These are useful callings, but in many young people they are passions born from analysis, not experience. They have been told to do something that they love, and have selected something from a fairly limited worldview that seems lovable. What most young people do is look at the outputs of an industry and say, "that one," rather than look at what one's day to day would actually look like. There is a remarkable lack of transparency across all career paths as to what you actually do all day, and when it's demystified, working to save education or the environment might not be as stimulating or high potential as one thinks. The second path was to follow my peers. There are places with brightly-lit roads to guide you there, undeniably attractive promises of advancement, prestigious firms, piles of cash, and whatnot. Many people take this bottom-up path, viewing your career as a series of steps to climb. It's a much more practical path than the first, and rather a strong start out of the gate in some respects, though it occasionally leaves one wanting in the self-actualization department. Often, these young people promise themselves that they'll be successful first, and do something they love later. However, if you're over 30, you might have noticed that the majority of your friends are still doing some permutation of what they decided to all those years ago - unfortunately, the same incentives that draw you to that brightly lit road are fairly good at keeping you on it. I, seemingly blind to everything around me, was not offered any of these incentives, and thus "resisted" the siren's call. 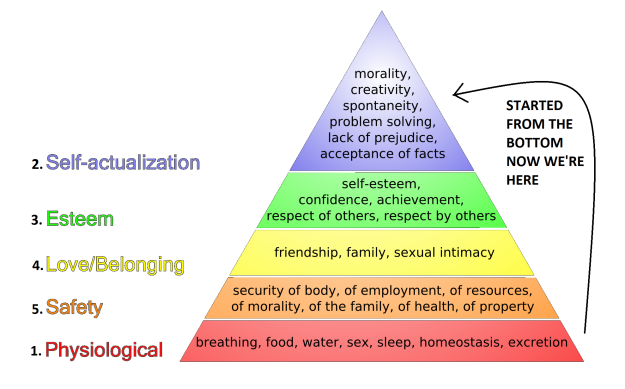 There's nothing wrong with this second path; it's definitely the most stable choice, and has generally good returns for the first four tiers of Maslow's Hierarchy (the 3rd tier might be an independent variable, but that's a blog post for someone else). For many people, it's a great choice, and the presence of a clear target (e.g. your boss's job) makes it easier to achieve. These two paths seem different, but they have something in common. Both treat your career as something you create, linear steps that can be considered in advance and charted for optimal efficiency. However, careers in your 20′s aren't that deterministic anymore. Stable jobs aren't so stable, brightly-lit tracks are subject to culling of the herd at each level (law, banking, etc. are necessarily pyramids), and opportunities come from the periphery as often as the direction you're pointing (source: that often-quoted "7 career changes in your lifetime" statistic, which even if its actually only 3 or so, is still a boatload of career changes). So if the bottom-up, step-by-step approach isn't for you, what approach should you take to your first couple jobs? I think there's a third path: follow the headroom. The common thread I've found among people who are happy in their early-career jobs are that they're challenged and encouraged to grow. If every time you evaluate an opportunity, you strip away the externalities, like perceived prestige, "mission," industry, or even money (to an extent), what you'll be left with is what you actually think of the opportunity. It's a challenging intellectual exercise, but I think it's worth it. Prestige, mission, industry, and money are ways to get you to focus on something other than what you'll actually be doing every day. The most important things in a workplace for a young person? Finding a team that you'll be excited to work with every day, and a boss that will give you the headroom to grow and expand your capabilities. Who cares what industry, or what the name of the company is, or even what they're paying you at first? Too many of us, I think. That's why people wind up trying to switch jobs all the time - maybe if they had more prestige, or $20k more, or worked in education instead of engineering. These are externalities. They cannot save you from yourself, and they won't motivate you to do good work. I'm hoping this is happening for me: I'm working in talent/staffing, a field in which I definitely had no interest at age 22. I got there by doing a couple dead-end jobs in politics and marketing that sounded cooler, and had cooler clients. Unsatisfied, I bailed to the unsexiest company I found, which paid me half my previous salary, but where the founder seemed like he would give me the most opportunity to grow. A couple much more interesting years later, I took the same approach to getting the job I have now: strip away the externalities, look for headroom. Esteem - people will respect you for being a good problem solver. Belonging - your self-confidence and happiness brings you the right kind of friends and significant other. Safety - you're good at what you do because it engages you; you'll get rewarded for it. So you see, I don't think we need to abandon the idea of doing what we love, just re-imagine what it means to find our way there. 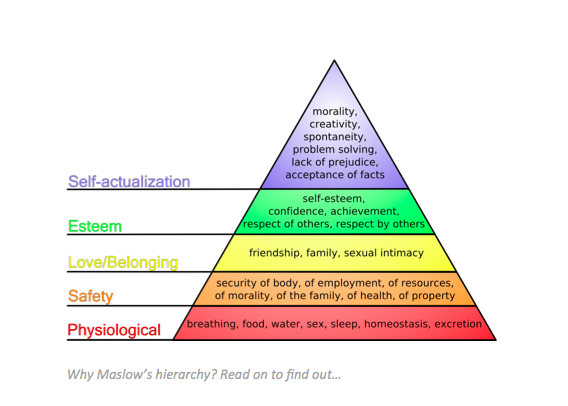 When it comes to careers, Maslow might have it backwards. 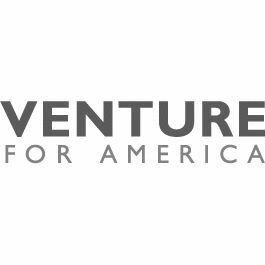 Mike Tarullo is VP of Corporate Development at Venture for America, a two-year fellowship program that places recent grads with startup companies to give them the experience they need to become entrepreneurs. Prior to VFA, Mike worked in Client Services and was a founding team member at a venture-backed NYC staffing startup. He's also spent time as a marketing consultant at a boutique marketing firm, co-founded a content aggregation startup and worked on a political campaign. He graduated from Duke University with a B.A. in Psychology.